PLUSCO 303 Rust Preventative Storage Fluid is a natural oil based rust preventive which functions as a water displacing fluid on metal surfaces. Upon application PLUSCO 303 Rust Preventative Storage Fluid forms an amber ultra thin, non-staining rust preventive film. Alter all water is displaced from the metal surface PLUSCO 303 Rust Preventative Storage Fluid provides a soft protective residual film which further protects the metal surface from rust and oxidation. This residual film is effective in the protection of ferrous and non-ferrous metals from atmospheric corrosion even under high humid conditions. 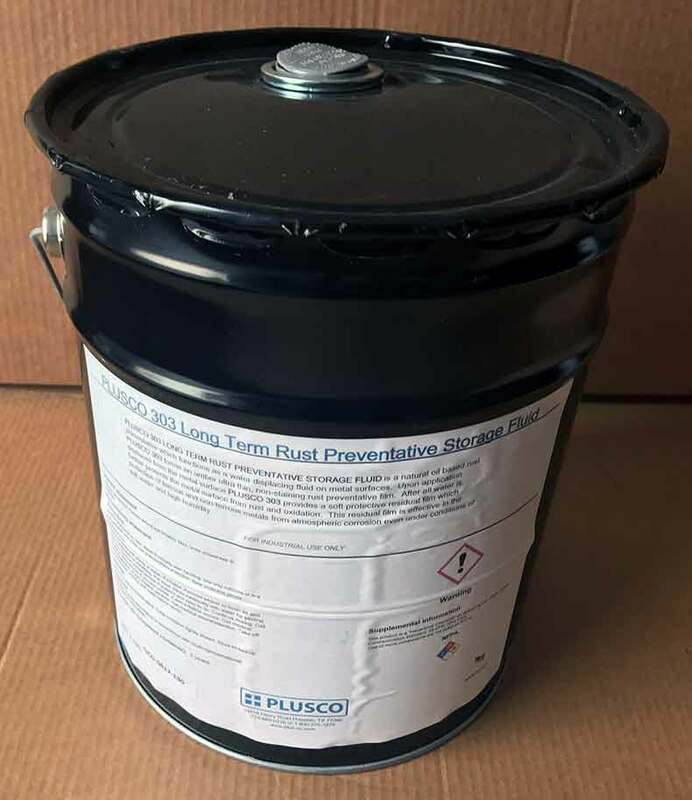 PLUSCO 303 Rust Preventative Storage Fluid is recommended for newly machined surfaces, threaded connections, and metal parts, fabricated components and equipment, particularly for shipping where rust and corrosion are a frequent problem. PLUSCO 303 Rust Preventative Storage Fluid is especially effective in protecting grinded or highly polished steel surfaces. PLUSCO 303 Rust Preventative Storage Fluid is also recommended for application to finished machined surfaces on tools while inventory for medium term storage. PLUSCO 303 Long Term Rust Preventative Storage Fluid can be removed with the use of a light grade hydrocarbon solvent.